Composition is a topic that befuddles many a budding artist. I find it helpful to start with the meaning of composition: “the act of combining parts or elements to form a whole.” Obviously that applies to many things. In school we wrote compositions to learn to express our ideas clearly and logically. Composition is so primary in music that one who writes music is called a composer. These days the composition of the objects we purchase, particularly everything we eat, is under careful scrutiny. We even compose ourselves before we go out the door in the morning (hopefully). Whether drawing something simple in your sketchbook, or painting a giant mural, planning the end result directly impacts the success of the work. For many years I didn’t understand what composition in art was. I felt that my focus in drawing and painting was to represent what I was looking at – why complicate it? Magically, one day it simply clicked, I got it. After years of hearing comments and suggestions, it all came together. Taking the time to plan how to present a subject directly relates to the ideas, expressed as well as the viewer’s comprehension. The first step in a composition is the subject – we need to choose what to draw. Just yesterday I was down at our local waterfront park. There were drawing possibilities in all directions. 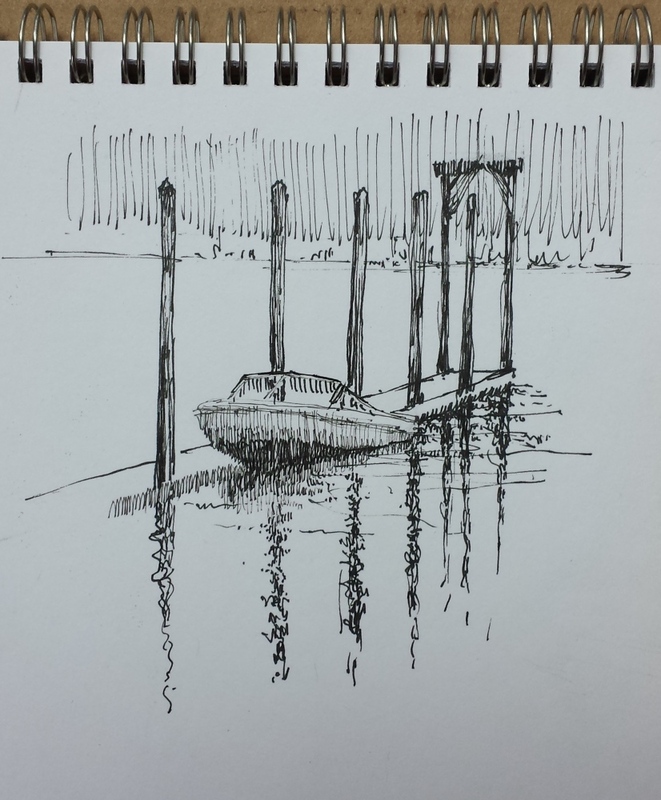 First, I did some quick thumbnails of potential subjects, then I decided to do a quick ink drawing of one boat along the public pier. Most of the drawings in my sketchbooks are like this – simple vignettes of a scene. I’ll be the first to confess when I’m sketching on location, I don’t analyze my subjects as much as I should. Something grabs my attention and I jump into the drawing. (I need to follow my own advice and slow down to plan). What appealed to me yesterday was the lone boat and the reflection of the pilings in the water. It can be as simple as that. Once the what is in place, take a few moments to think about why a subject is appealing. Ask yourself, what’s important or distinct about this scene? How does it make you feel? You don’t need an earth-shattering response. If you just like it – go for it. This is the first step. My previous thumbnails had been all about various docks, the rocks on the beach, and assorted buildings and vegetation along the waterfront. I finally found just focusing on this small view quite satisfying. Stay tuned for more on composition. Over the next few posts, I’ll address some of the things to consider. If you have questions as we go along, don’t hesitate to ask.